Selling merchandise can be a great tool for engaging supporters — they get to represent causes they care about, and you get to promote your work and establish an additional fundraising channel. 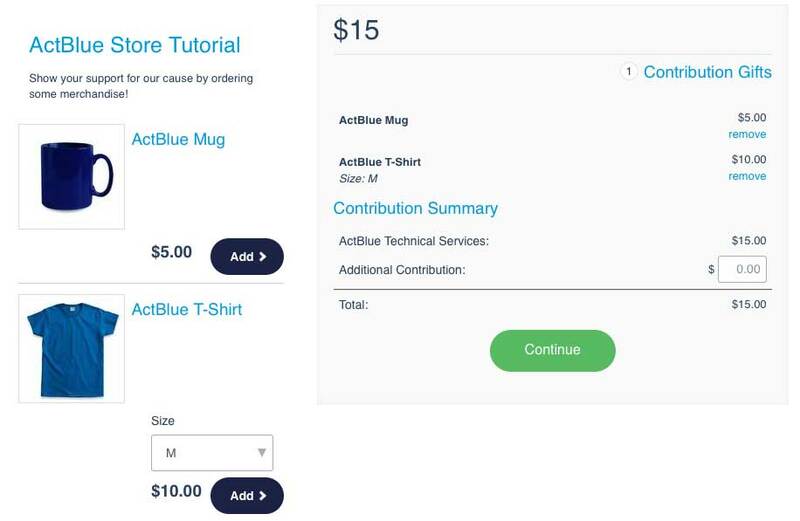 That’s why ActBlue gives you the tools to easily sell merchandise to your supporters. Once you’re ready to start selling merchandise, navigate to your Dashboard. At the top of your Overview page, click the blue "Create form" button and select "Merchandise form" in the dropdown. A pop-up will appear where you can fill in your form's basic information. First, give your form a title. Then finish the web address for your form by typing a simple word in the “Web address” box. 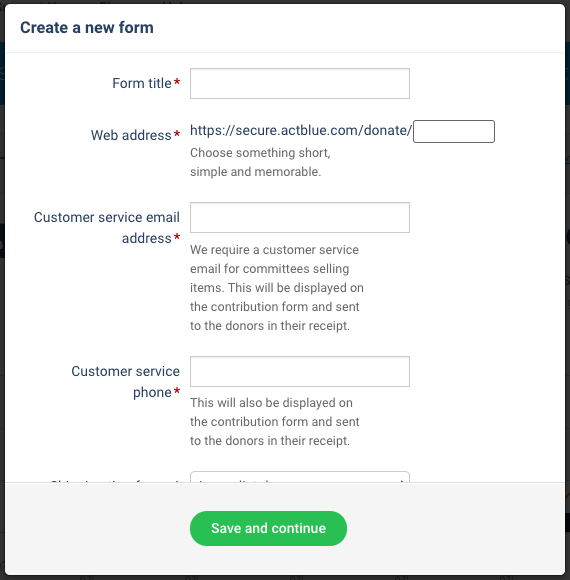 This word (or phrase) will not only be part of the unique web address for your form, it will also be the name of your form in your ActBlue Dashboard. Pick a short word or phrase and make a note of it so you can locate your form in your “Contribution Forms” tab quickly. Next, enter the email address and phone number your supporters should contact for customer service. These will be displayed on the merchandise form and in your supporters' receipts so they can get in touch with any merchandise fulfillment issues. Finally, you’ll need to go to "Shipping timeframe" section and estimate when donors can expect their items to arrive. This is an incredibly important piece of the merchandise puzzle. It’s important to have a fulfillment plan in place before you start selling items so you can make an accurate estimate here. 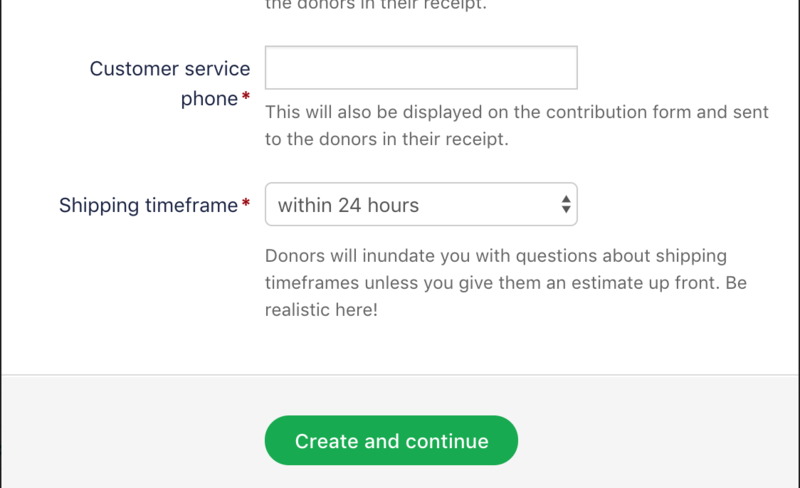 You don’t want your donors to get frustrated with longer-than-expected wait times. This will be set to "within 24 hours" as the default, but you can choose from 3-7 days, 1-2 weeks, 2-4 weeks, 4-6 weeks, and 6-8 weeks. You can always go to the form’s “Contact and shipping” tab to make any edits to this basic information later. Once you're finished with the basics, click "Create and continue" to be taken to your merchandise form. The form editor will be open on the left. In the "Title, ask, and URL" tab you can edit your form's title and add a description or message in the "Donation ask" section. Remember to save your changes by clicking the "Publish changes" button! Next, go to the “Items” tab where you can add your merchandise. The first step is to click the “Add item” button, which will show a pop-up window for adding merchandise. Here you can add an item’s name, description, price, and image so that donors clearly know what they’re buying. 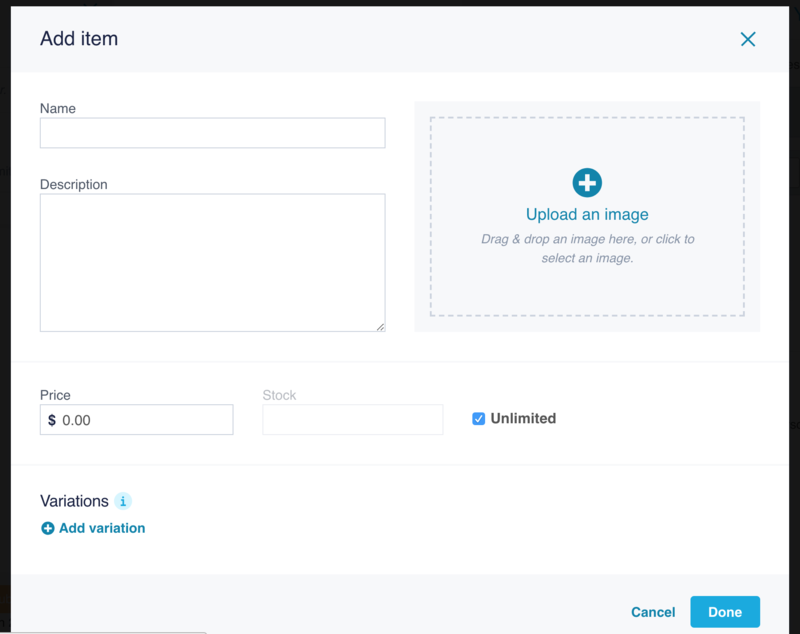 Images should be as high-resolution as possible, and you can upload your image by either clicking the “Upload an image” button or simply dragging the image file into the image upload area. If you have a limited supply of an item, be sure to uncheck the “Unlimited” box and enter the number of items you have available in “Stock.” Once you’re sold out, the item will disappear from your live merchandise form.You'll be taken to the Manage Gifts page for your form. Here you can add your merchandise offerings. You’re required to add a description of each item, a price, and an image so that donors know what they’re buying. If you have a limited supply, check the box under Limit and enter the number you have available. After that many are sold, the option will disappear from the form. Click the "Save" button when you are done adding each piece of merchandise. The minimum price for an item is $1, so you cannot leave your item’s price at $0. If you try entering zero in the “Price” box, a message will prompt you to enter a dollar amount. Next you can add any variations that your merchandise may come in, such as different sizes, colors, or other options. You can create a variation by clicking on the “Add variation” button. Name the variation of your item, and add all of its options (i.e. The variation name would be Size and the options would be Small, Medium, Large). More information on variations is available if you click the blue, circular “Information” button. Once you’re done entering all information about your item in the pop-up window, click the “Done” button to go back to the “Items” tab of the form editor and see the preview of your form. (Just like any other form, you’ll still need to press the orange “Publish changes” button at the bottom of the form editor for your up-to-date merchandise to go live.) 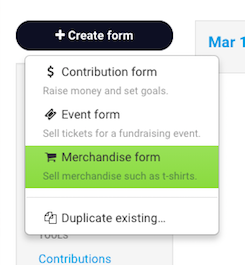 In the “Items” tab, you can drag item entries to change the order they appear in on the live merchandise form and choose to hide specific items from the live form so that supporters can’t buy them. Now you’re ready to click the “Publish changes” button so that your items go live! When looking at the “Items” tab, watch out for an orange dot in the upper right-hand corner of an item’s entry. An orange dot tells you that you’ve made changes within that entry that you have yet to publish. And if you see a red dot, there’s an error in your item’s entry that must be fixed before publishing. Return back to the main menu of the form editor to add a branding or customize your merchandise form in other ways. You can make changes to your merchandise form using the form editor like you would for any other contribution form. 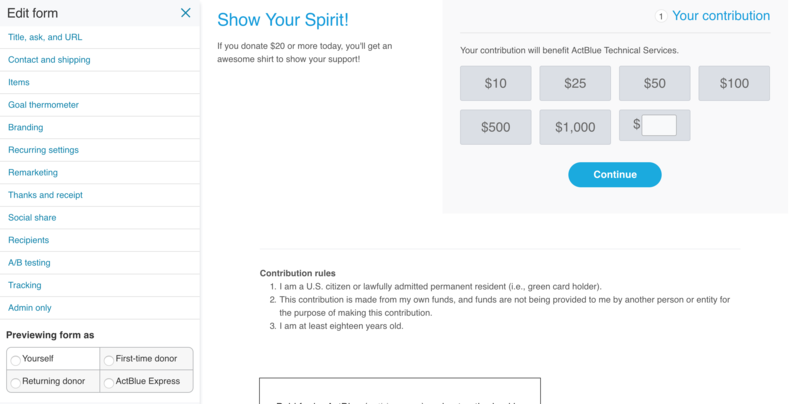 Donors also have the option of making a supplemental donation in addition to the cost of the merchandise when they visit your merchandise form (pictured above). To make the fulfillment process easier on your end, we provide a CSV of all the orders your form receives. You can download the CSV by navigating to your form’s Statistics page and opening the "Additional tools" dropdown. The easiest way to get to a form’s Statistics page is clicking on the "Statistics" button when viewing your form. 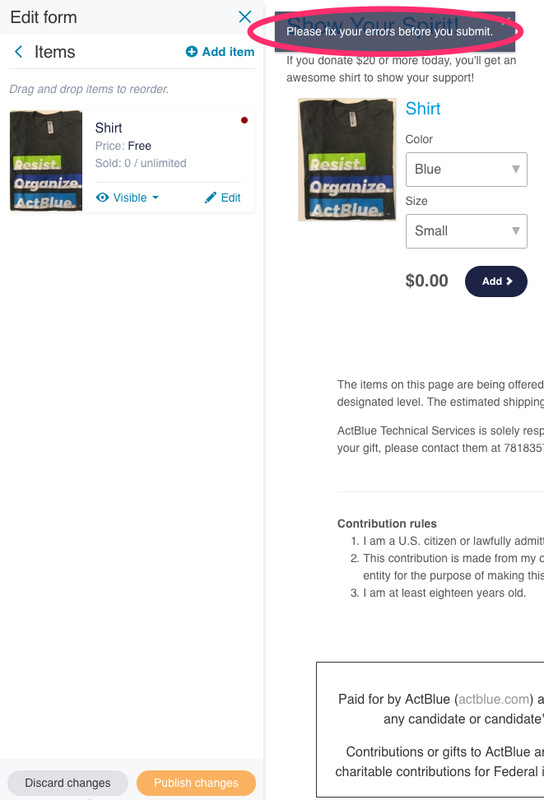 Some important notes to keep in mind when selling merchandise: You are are solely responsible for producing and shipping any items offered through your ActBlue merchandise page, and your merchandise item is considered a gift in exchange for a contribution to your campaign or organization, so you’ll need to report these contributions as you usually would.